I am not usually one for anthologies but My True Love Gave to Me might just have changed my mind. I thoroughly enjoyed this short story collection! My favorite thing about this collection was that they all had to do with the holiday season. It was fun to see how each author interpreted the holidays. 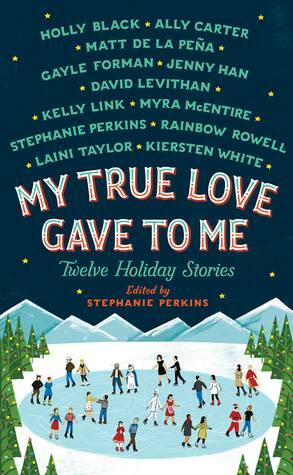 While I enjoyed each of these stories I thought Midnights by Rainbow Rowell, The Lady and the Fox by Kelly Link, It’s a Yuletide Miracle, Charlie Brown by Stephanie Perkins, and Welcome to Christmas, CA by Kiersten White to be standouts. Midnights is about two best friends and how they celebrate New Years and what happens when they both go to college and reunite again on New Years. It was painfully cute and poignant in the way Rainbow Rowell always is. The Lady and the Fox was my first introduction to Kelly Link and it was definitely a good one. The story reminded me of The Nutcracker, it had that magical Christmas feeling. It’s a Yuletide Miracle, Charlie Brown was also painfully cute while dealing with tough issues like hoarding and familial abandonment. I love Stephanie Perkins style of writing; she immediately draws me in and makes me love her characters and this story was no exception! Welcome to Christmas, CA by Kiersten White was the only story in the anthology to make me cry. It wasn’t big tears it was the happy kind of tears but I never cry so it really surprised me. The story was about wanting to move far away and realizing the place you’re trying so desperately to leave is home. Overall, I enjoyed this collection of short stories. If you’re looking for the perfect holiday read look no further! I love the title to Perkins' story! :))) I was going to start this last night, but then I fell asleep! I loved this! I had an ARC, but I just had to get a physical copy when it was released. Now I'll have it for December re-reads every year!